Why come to Ghost Ship Harbor with your group? There are many reasons to come and get scared with your friends at Ghost Ship Harbor. Every year we completely revamp the attractions so no two years are the same. Our goal is to give you a night out where we thoroughly entertain you from start to finish. Ghost Ship Harbor is the only Haunted Attraction on the East Coast taking place on a Navy Ship, the USS Salem. The USS Salem was featured on a 2009 episode of Ghost Hunters. It has been known to have paranormal activity and believe us, we can vouch for it! Whether you want to get scared by our actors or real ghosts, Ghost Ship Harbor has something for everyone! 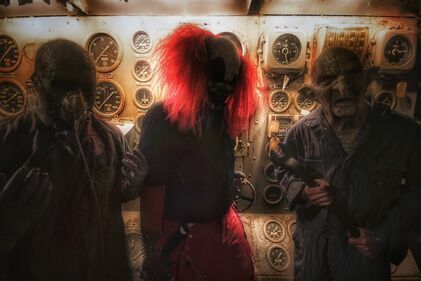 Unique- This is one of the only Haunted attractions on a Battleship and the only one on the East Coast. People come from all over to come to this attraction because its so unique. Fodor's Travel rated it the #1 scariest haunt in Massachusetts in 2017! Large groups-We can handle groups from 20 to 2,000 large corporate outings. Let us know how we can help make your night for your group amazing! -Anyone looking to have fun!